Prague is the stunning capital city of the Czech Republic. It’s aged streets pop with color from the baroque buildings which line them, as pockets of gothic architecture create stark contrasts throughout the city. 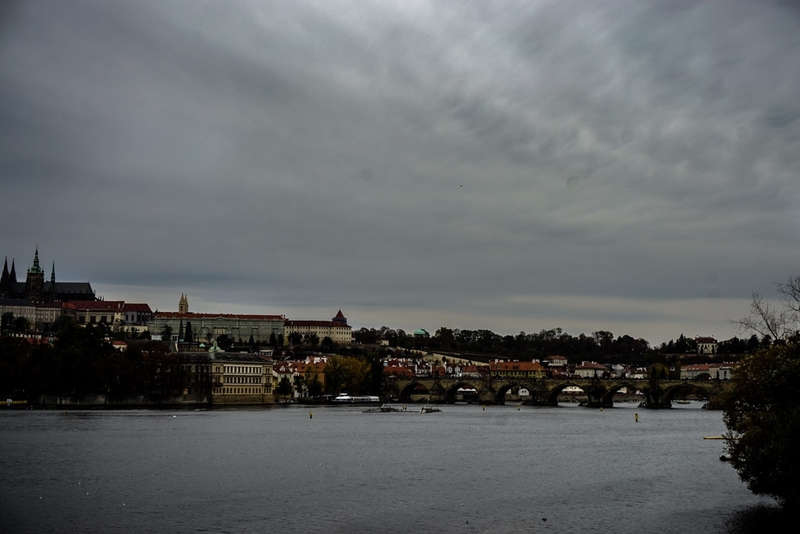 Whilst Prague is beautiful and eye pleasing to look at, it certainly possesses a darker side. 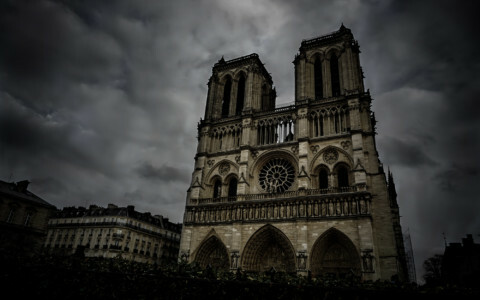 Throughout history, this haunted city has acquired gruesome tales of death, ghosts and the Devil. 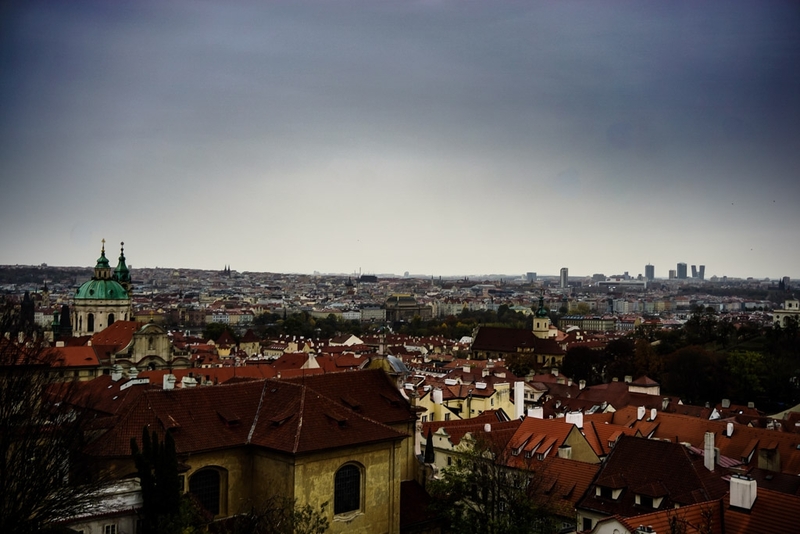 Below is where you will find the most haunted places in Prague. Bird’s eye view of the haunted city, Prague. 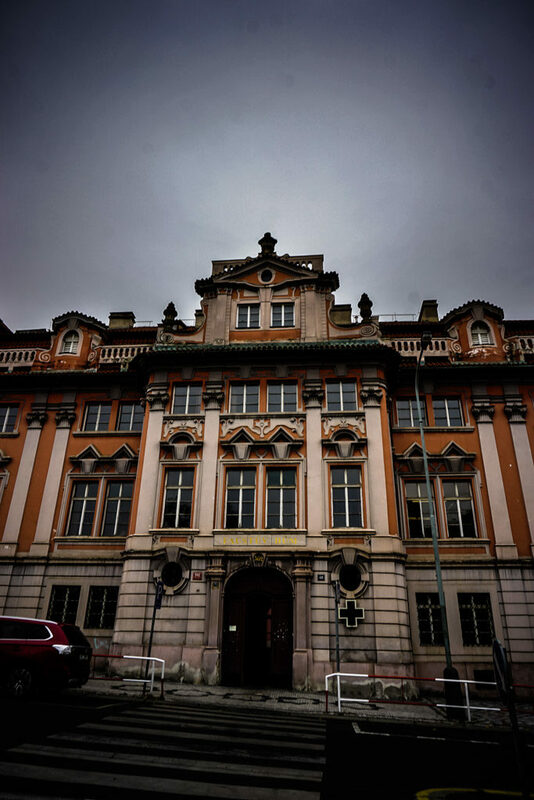 Our first haunted location within Prague is the infamous Faust House. Today, this building holds various businesses and classrooms, but it was once an abandoned shell. This property is well known locally for its mysterious ties to the Devil. Stories had swirled about the Faust House after it fell into abandonment. Local whispers that the previous owner had been taken to Hell via a hole in the house’s ceiling were widespread. Though, to a homeless student desperately seeking shelter from the harsh weather, these scary stories were no deterrent. 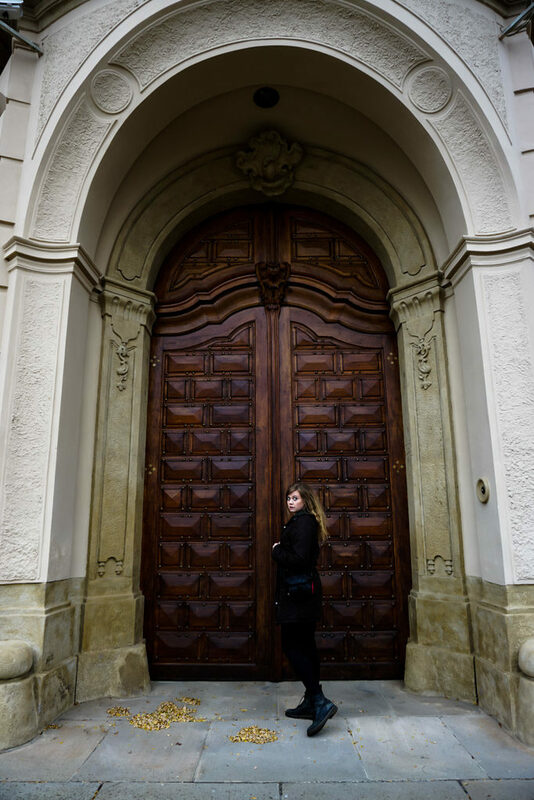 Standing outside the notorious Faust House in Prague. Supposedly a hard-up young man had entered the property after noticing its front door ajar. Despite being versed in the Devil stories related to the property and having sighted a large hole in Faust House’s roof, he decided to sleep inside the abandoned house. Covering the hole with a thick piece of carpet he had scavenged. Legend has it that this young man awoke the following morning to find a coin inside of a bowl. This supplied him with more than enough food for an entire day. After this, each morning another coin would mysteriously appear inside of the same bowl. The young man’s demise soon came about after he developed a greed for more of these coins. He apparently summoned the Devil in order to demand more wealth and was consequently dragged to hell through the same hole in the ceiling the original owner had been. Exploring the haunted Faust House. Faust House can be located at Na Slovanech, 128 00 Nové Město, Czechia. The Charles Bridge is one of Prague’s most visited attractions. Although it doesn’t hold a formal ghost story, it does have a dark past laced with death and some superstition surrounding it. The spooky looking Charles Bridge in the distance. It was a place where the severed heads of leaders were suspended during the 1600s. This was done so after they were executed. Rather grotesquely, they remained suspended from the towers at either end of the bridge for around a decade. 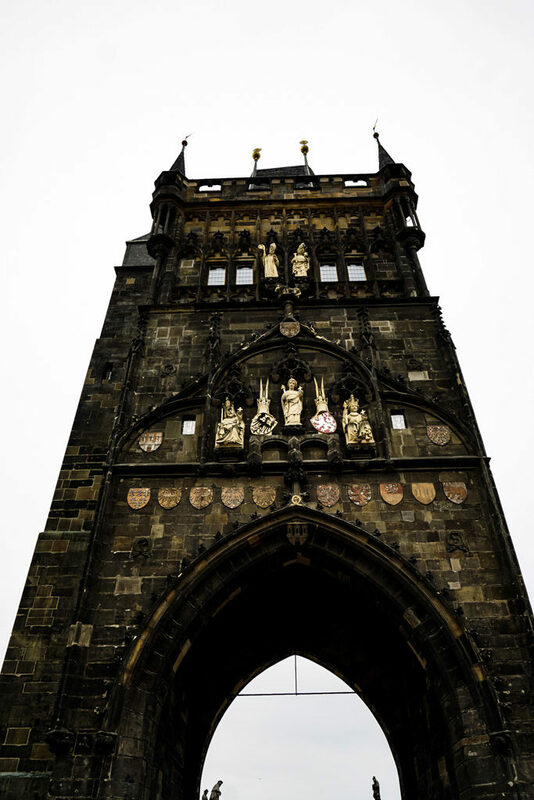 One of the towers that lead into Charles Bridge. Where severed heads once hanged. Another link to death the bridge has dates back even further to the 14th century. It is said that a man was killed by being thrown from the bridge after refusing to tell the king information he possessed about the queen. This man’s death has been commemorated on the bridge with an engraved plaque. It is said that touching this plaque will bring good luck. Touching the Charles Bridge good luck plaque. The haunted Charles Bridge can be found at Karlův most, 110 00 Praha 1, Czechia. 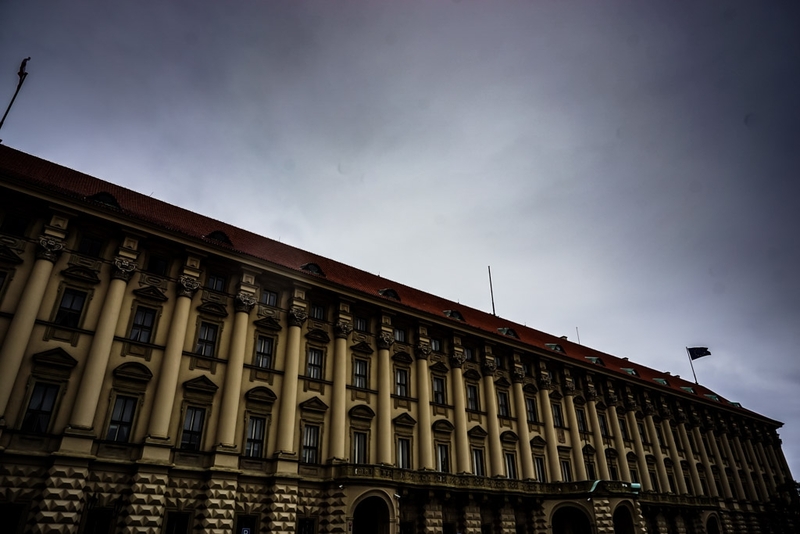 Today, the Cernin Palace is home to the Czech Ministry of Foreign Affairs. It did originally house a wealthy and noble family though. They lived within the palace from the 1600s to the 1800s. The glorious and forboding Cernin Palace in Prague. This family was not well liked by their surrounding townsfolk, as they were vain and greed-filled. The Dutchess who lived within the palace held a particularly unpopular status for her lavish and extravagant lifestyle. It is told that she would eat delicacies and bathe in milk, while people in the surrounding village were starving. Her self-indulgent behavior peaked during a great famine. Her response to which was to throw an extravagant ball where all attendees were to wear shoes made from dough. This obviously angered the townspeople, yet also angered demons said to dwell in the nearby courtyard of the palace. It is said that during the ball, 9 demons stormed the party and danced the Duchess into a frenzy. She was made to dance so hard that her shoes set on fire. The demons then proceeded to drag her to hell. Stories vary and she was either dragged through the floor of the ballroom or the courtyard where the demons occupied. Hoping to sight the Duchess ghost of Cernin Palace in Prague. Ever since many people claim to have sighted the apparition of the Duchess wandering the palace halls at night. She is now one of Prague’s most well-known ghosts. 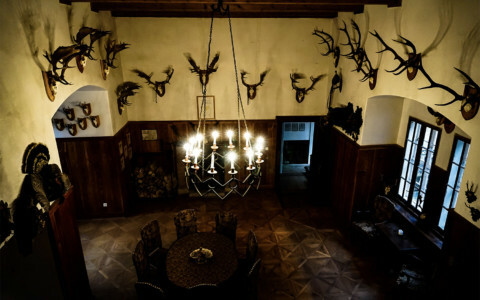 You’ll find the haunted Cernin Palace at Loretánské nám. 5, 118 00 Praha 1, Czechia. 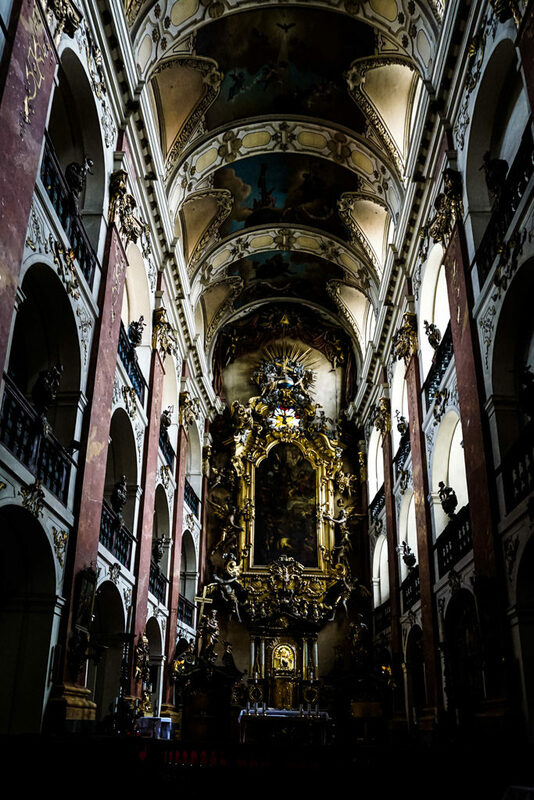 Our next haunted Prague location is both a beautiful and holy one. Many believe that the Convent of St. Agnes is haunted by a nun who was murdered. 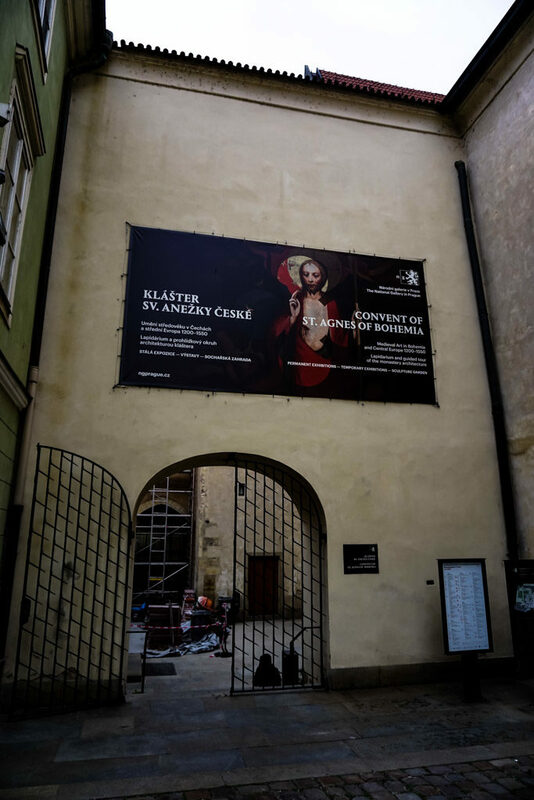 Entrance to the Convent of St Agnes, Prague. This ghostly nun’s story is quite a tragic one. Supposedly in life, she had fallen in love with a knight who was poor and of much lower social status than she was. This was angering to the girl’s father who consequently organized to have her moved away to become a nun at the Convent of St. Agnes. 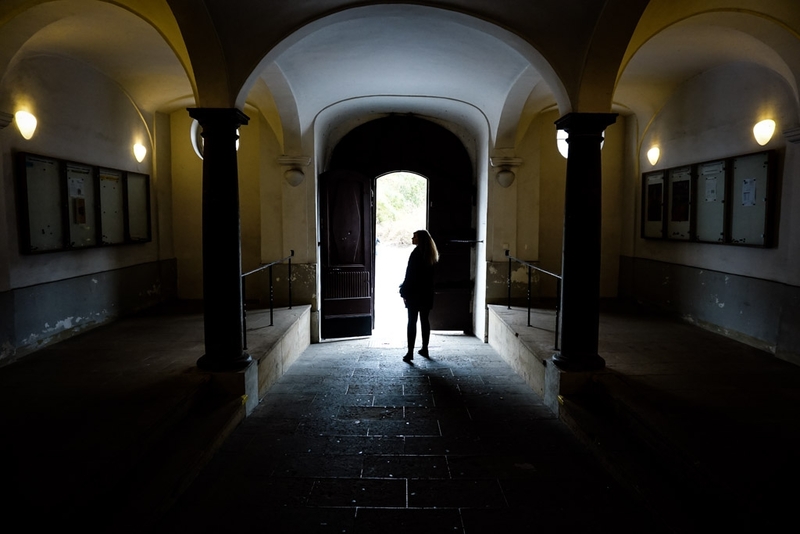 It is told that the night before she left for the convent, the girl snuck out to meet her forbidden love for the final time. Tragically, she was instead met by her enraged father who stabbed her to death. Since then, many people have claimed to sight the apparition of a nun within the Convent of St. Agnes. She is sometimes described as being soaked in blood. Other times as smiling carelessly at visitors before disappearing into thin air. This nun is also said to perform good deeds. She allegedly once stopped a young girl from taking her own life due to a messy love affair. Providing the girl with enough wealth to live a comfortable life. 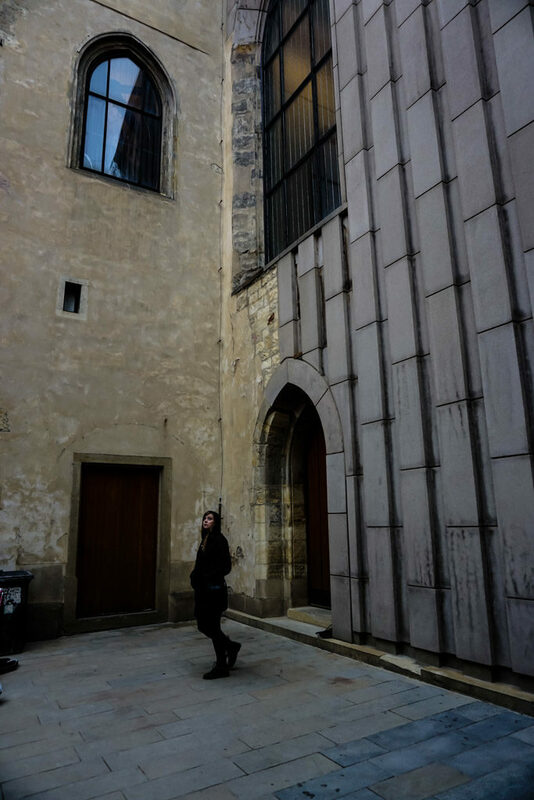 Exploring the courtyard of the Convent of St. Agnes. You’ll find the haunted Convent of St. Agnes at U Milosrdných, 110 00 Staré Město, Czechia. Our final and most haunted place in Prague is the Basilica of St. James. This ornate church holds a creepy omen to a dark past and a horrid story of death. The brilliant and stunning interior of the St. James Basilica in Prague. The church is supposedly haunted by Count Vratislav of Mitrovice. During the 1700s, the Count was interred here after many believed him to have died. Sadly and horrifyingly, the Count was not actually dead when he was interred within the St. James Basilica. Legend has it that his moans and cries of terror echoed throughout the church leading many people to believe it to be haunted. In a wicked turn of fate, after the Count had actually died, his soul remained within the church to haunt it. Another dark story contained within this church remains on display after 400 years. Those who enter the Basilica of St. James and peer upwards to their right will see something shocking but discreet. 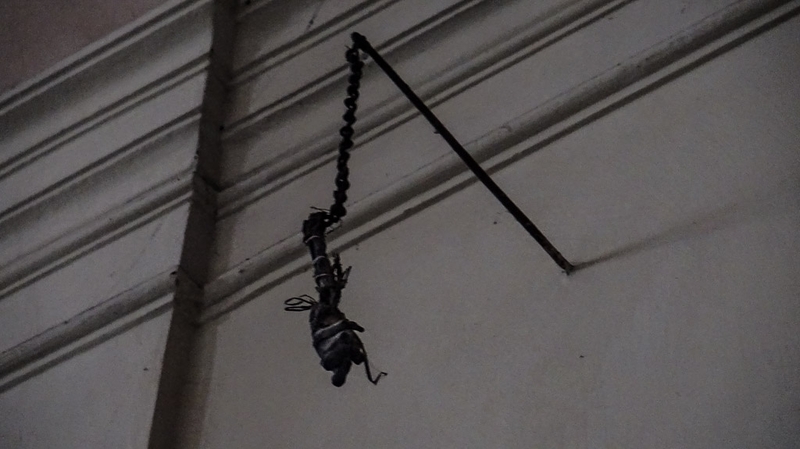 Here, from a meathook, hangs a 400-year-old mummified arm. This arm is said to have once belonged to a thief who broke into the church and attempted to steal jewels from the Virgin Mary. It is said her statue came to life and grasped ahold of the thief’s arm, refusing to let him loose. The only way the thief could be released was to amputate his arm. After this ordeal, his arm was displayed as a deterrent to other would-be thieves. Mummified arm hanging inside the Basilica of St. Agnes. Visit the haunted Basilica of St James and mummified arm at Malá Štupartská 635/6, 110 00 Staré Město, Czechia. Looking for other spooky places to visit near Prague. 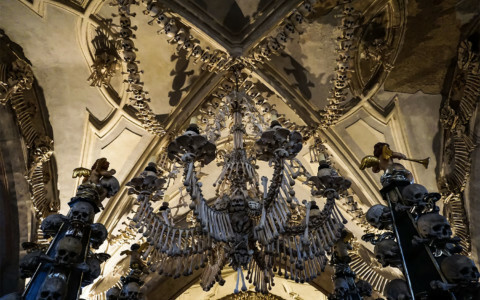 I highly recommend checking out the nearby Sedlec Ossuary bone church.